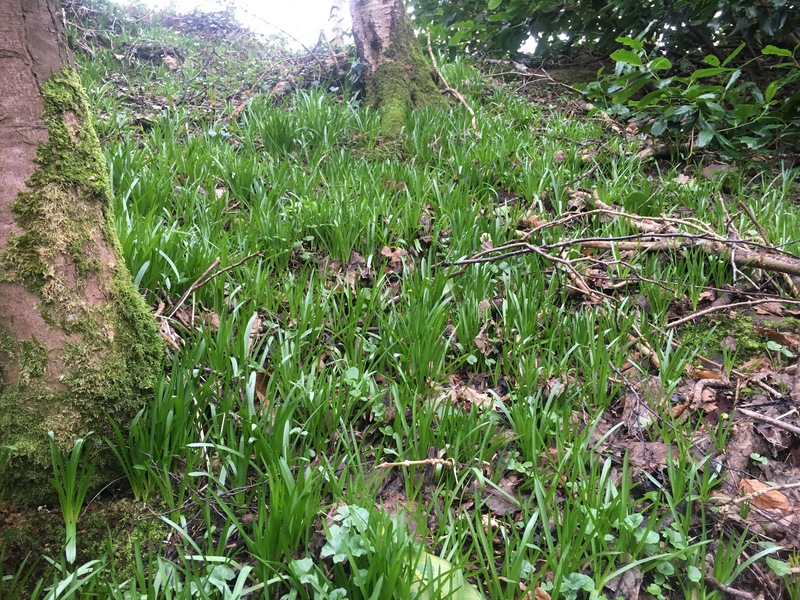 While walking through the many parklands and forest parks in mid Ulster, visitors often miss out on the scenery either “browsing”, or waiting on 3, 4 and at some stage in the near future 20G to return. Young parents with toddlers can be found negotiating as to whether they were following the red, yellow or green trail and the runners are busy “mapping” their life with headphones in, dodging potholes while checking their BPM. 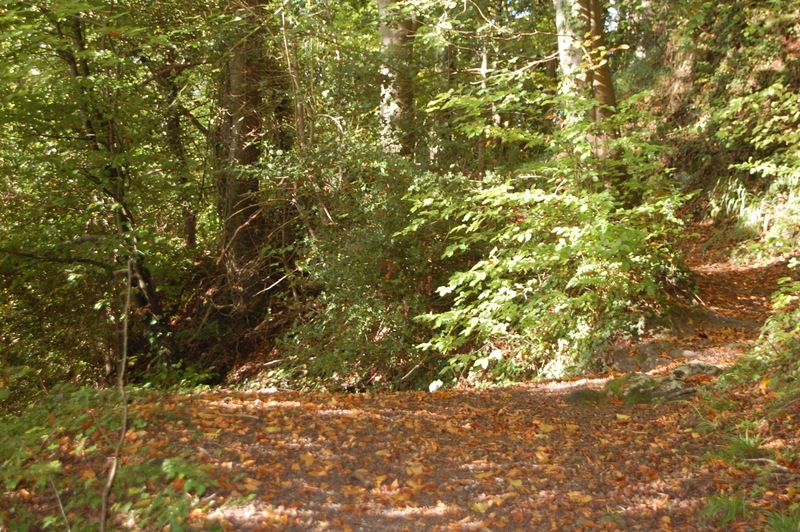 Walking along the Blackwater at Benburb you will find a place that has not followed the latest parkland trends. It is a place of adventure where trails are often hidden and should you dare to explore, you will find nature at its best. 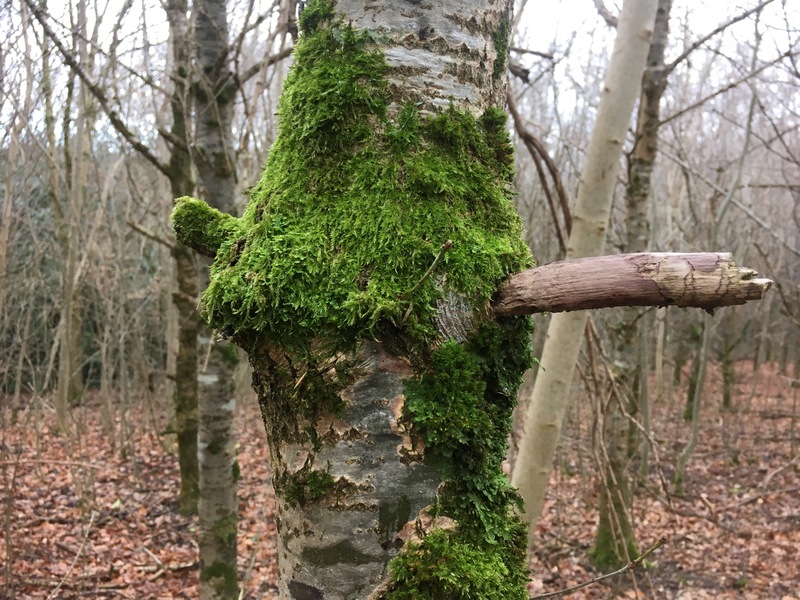 Using reliable navigation methods such as the river, streams and the leaf covered tracks, you can walk”off piste” to find some hidden treasures. It’s certainly not a place for nice new trainors so come prepared. 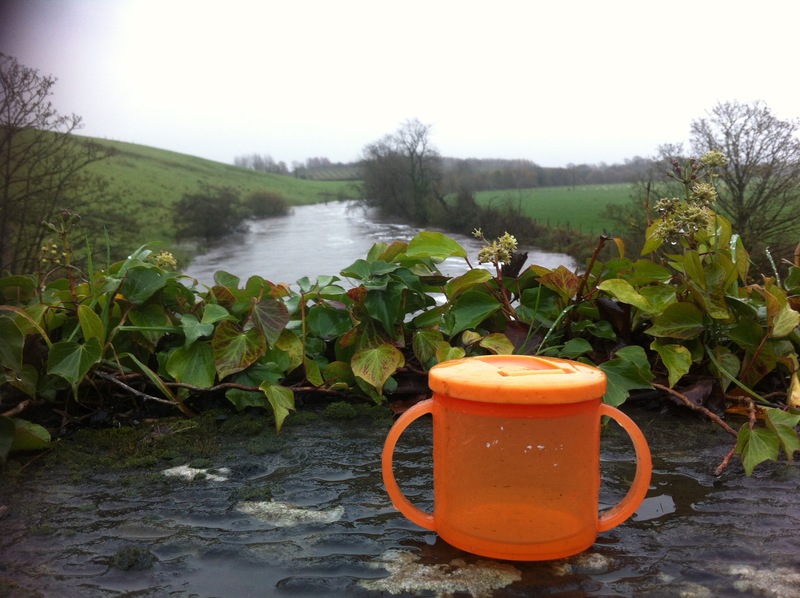 An orienteering post was the start of our adventure yesterday, while out participating in the Benburb bioblitz part 2. While the adults were discussing the possibility of a trail nearby, and paused to view an old map, the kids took off. 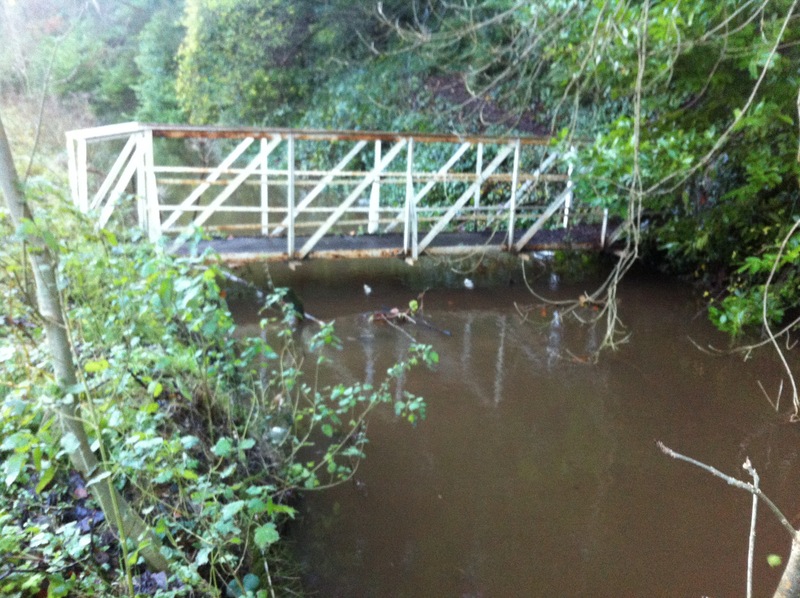 After a few yards they discovered an old footbridge that was disguised as a moss covered carpet. It wasn’t long until they had rolled back the moss, checking for bugs and additional items for our survey. A great find! This was just what we needed to re route our bio blitz walk and follow a new trail. 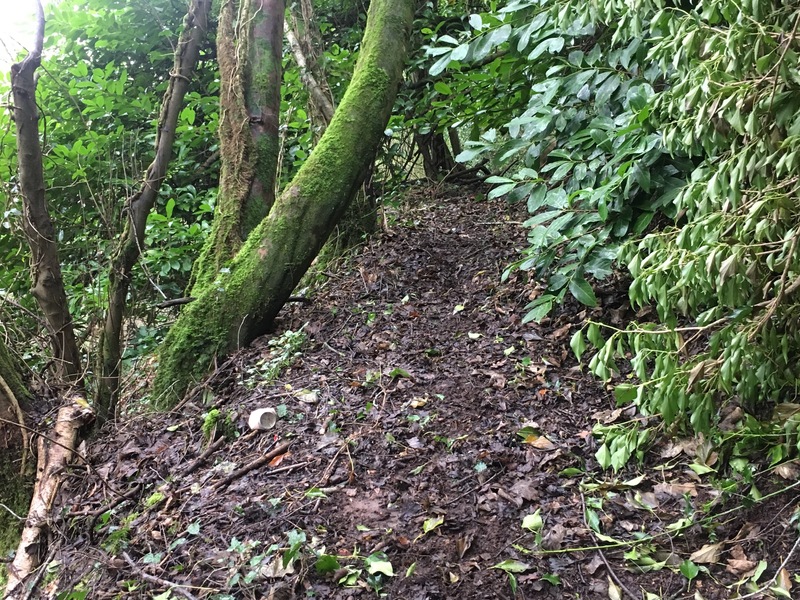 The route was a little obscure at first but a path was apparent and we walked on as the kids scrambled uphill excited by the discovery of a new trail. 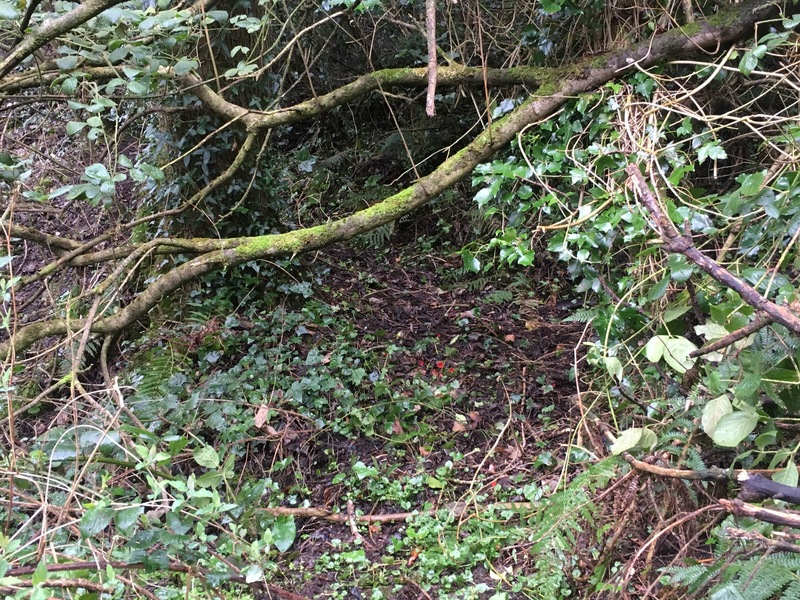 It wasn’t long until the trail opened up to reveal a wonderful ancient bluebell wood, a “secret garden” high above the river Blackwater. This will definitely be worth revisiting in the coming weeks as they start to flower. 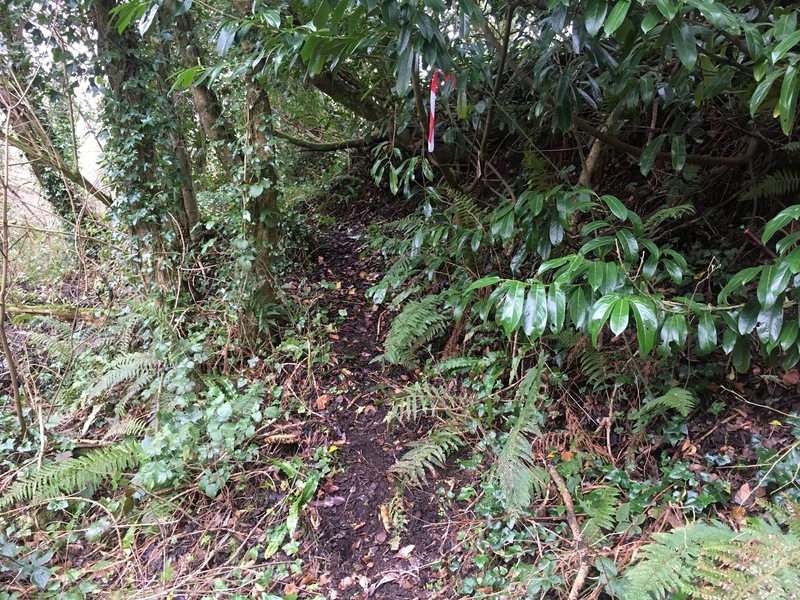 Walking along the old woodland trail that is overgrown and green, moreso by the invasive laurel visitors, than native trees, we stopped to view the latest edition, Portuguese laurel. Man’s favourite garden hedge has long visited these woods and is trying to take over. At the edge of this forest sits a lovely snapshot reminder of how it once looked. 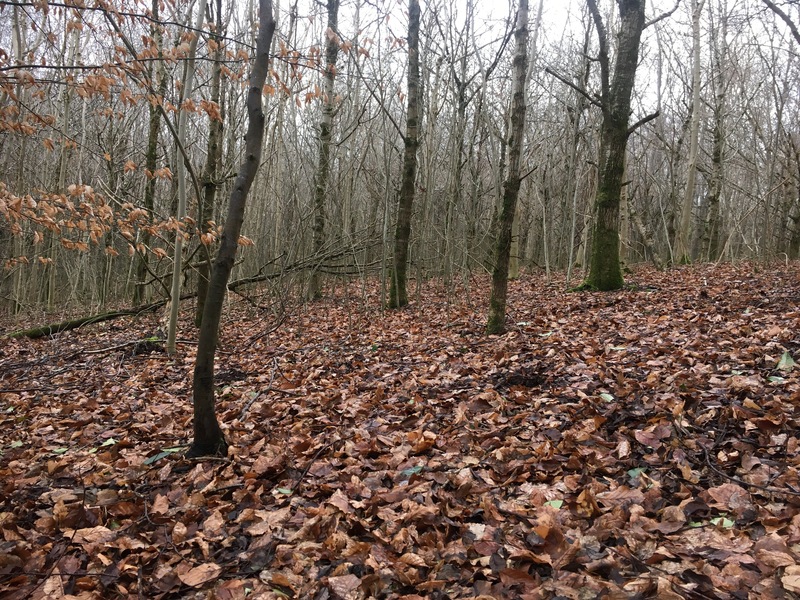 Small beech and oak trees with a carpet of leaves. The addition of light makes it hard for the green moss and ivy to grow. This area has become home to a few air ‘badger ‘ B n B’s. While out foraging away from home they can often take refuge in a nearby den. By the “sweet” smell in the air they must have been partying late last night. Plenty of scratching holes provide evidence that they were out feeding into the early hours. The dark hedges days may be numbered after battles with storm doris but fear not we can always invite game of thrones to Benburb in a few years to use our woodland set. The almost robotic precision of this planting must have been paving the way for the return of an O Neill clan to march back to the castle. 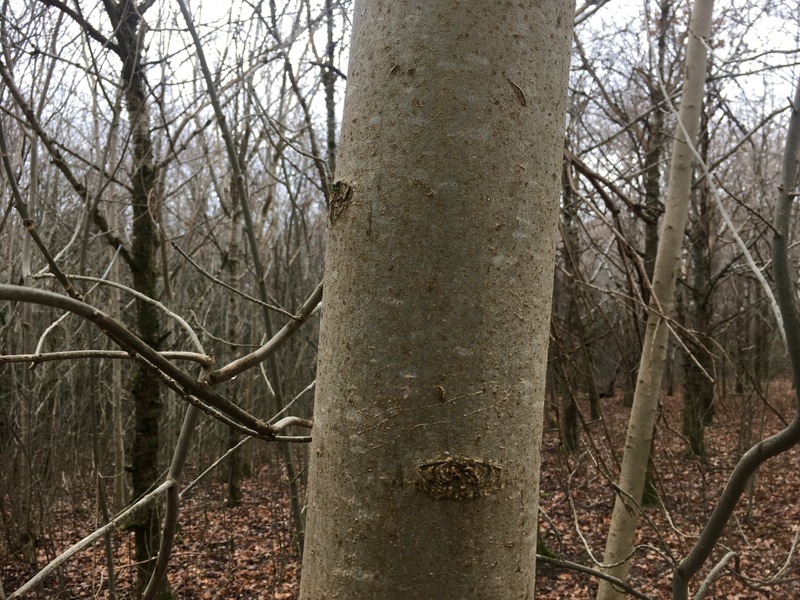 The importance of the mighty oak to the biodiversity of a woodland is clear when you look at the bark of an oak compared to an Ash tree, in the pictures below. Oak forests provide a habitat rich in biodiversity; they support more life forms than any other native trees. They host hundreds of species of insect, supplying many British birds with an important food source. 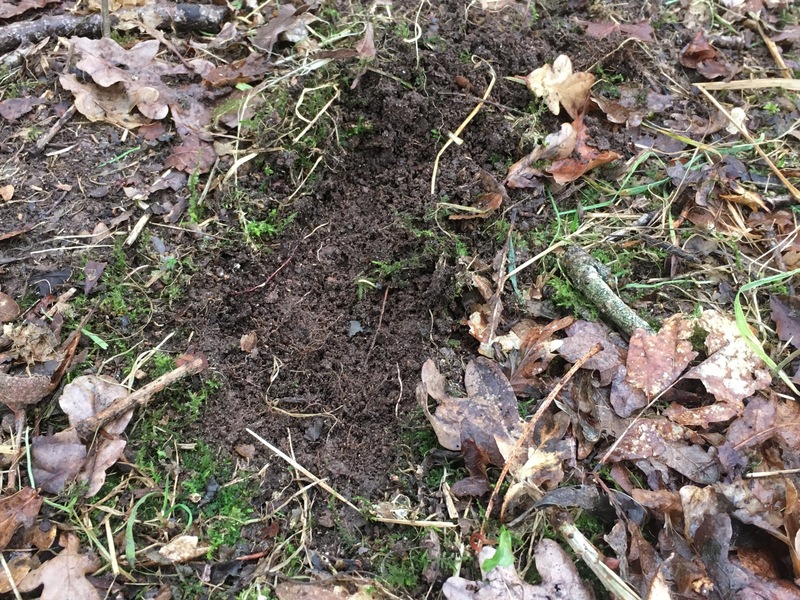 In autumn mammals such as badgers and deer take advantage of the falling acorns. A short walk downhill through the old forest and we returned to the main path along the river, enriched by the sights and scenery along our walk. 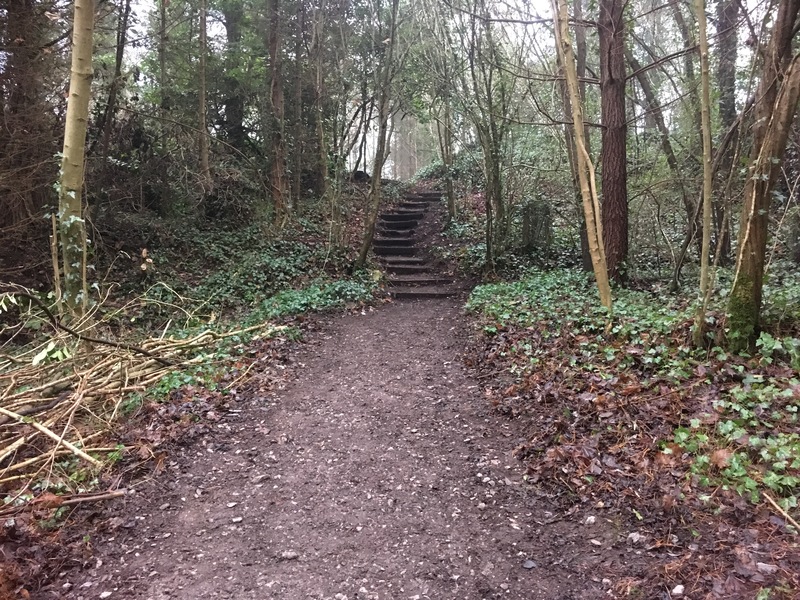 If you would like to learn more about this wonderful area and volunteer to help look after the valley park please contact Alynjones@allianceyouthworks.org.uk or via Facebook for info on future events and activities. 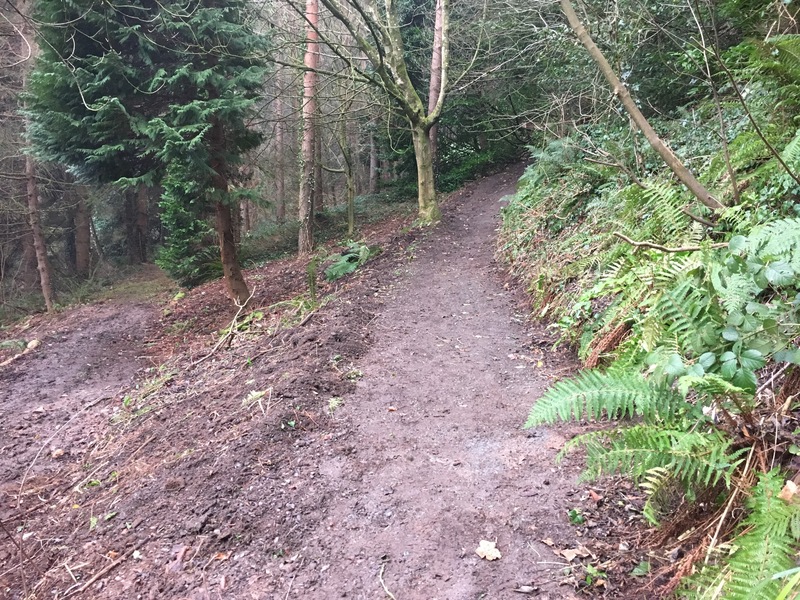 The trails along the Blackwater at Benburb valley have been transformed lately providing a glimpse into the past and a throwback to its former glory days when a team of locals worked the site. 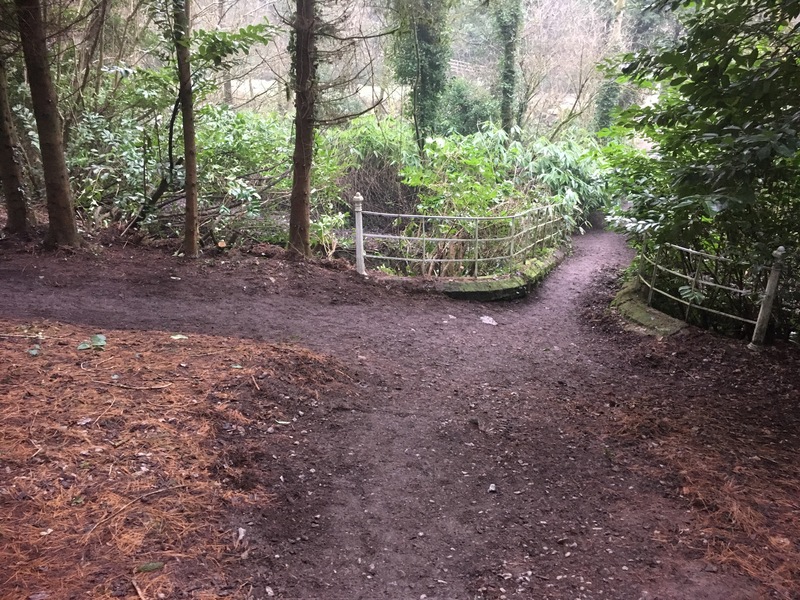 A combination of natures growth and a lack of activity led to a “sleeping beauty” effect with paths and trails blocked and hidden from view for years. 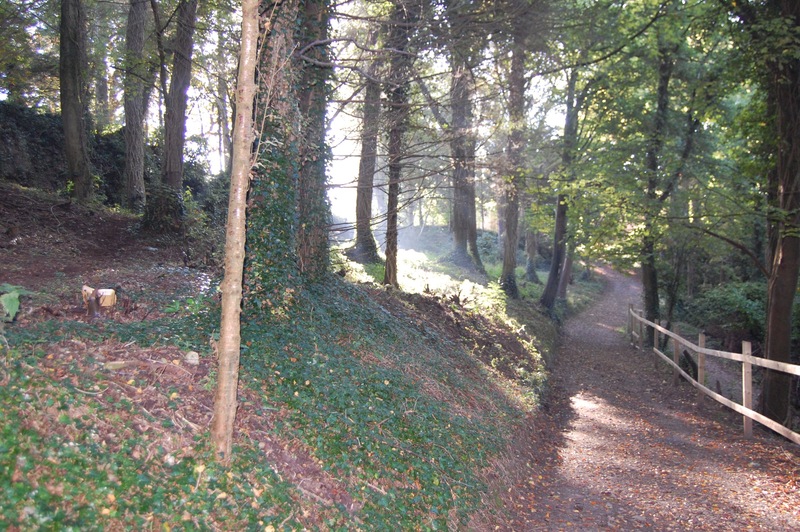 A walk today reveals an improved site that is more inviting and enjoyable to journey round. 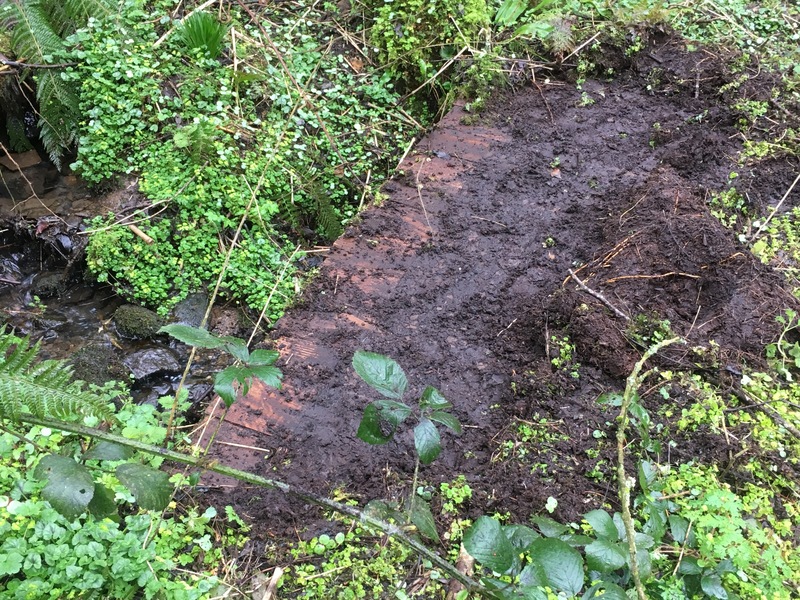 This work has not been the result of a “cash for ash”, or indeed from any grandiose public investment scheme. 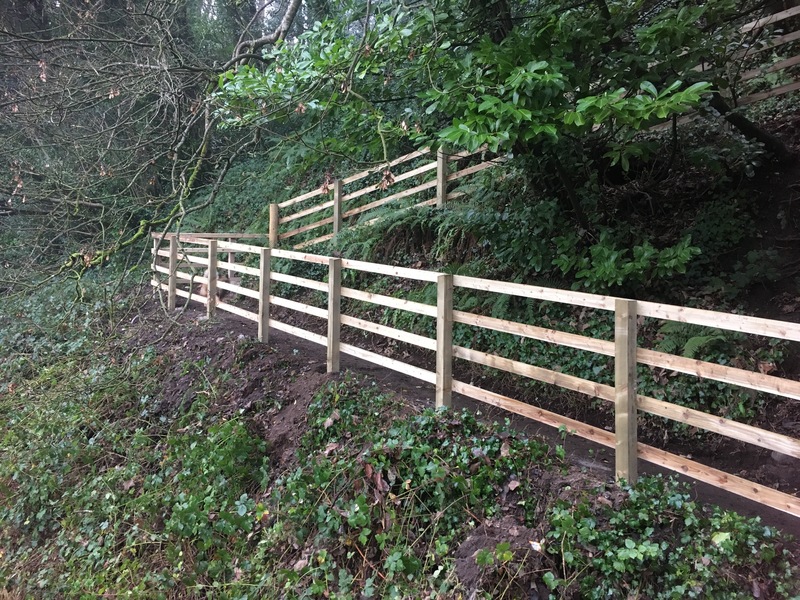 It has resulted from a community lead approach requiring a team of volunteers who graft daily on site with a simple desire to change and improve their local area. They are supported and encouraged by the local community, the servites at Benburb Priory and on the ground by Alliance Youth Works, who all help co ordinate the projects. This area is of interest to many groups like the local fishermen and women at Benburb who all try to do their bit to look after this large diverse site. 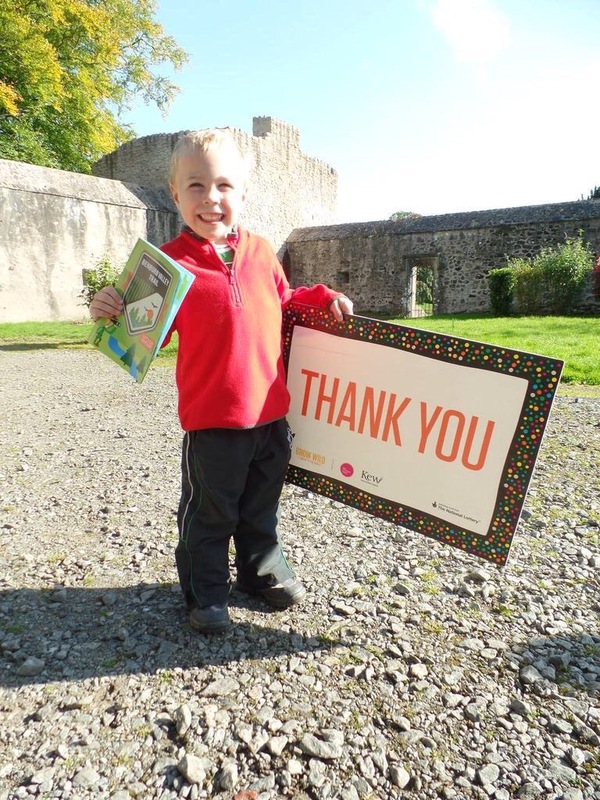 Children from local schools are now able to enjoy activities outdoors in a safer and improved site thanks to the many unnoticed “silent” volunteers. If you enjoy outdoor activities and want to take up something new to start the year, why not drop down to see Alyn in Benburb Castle on Tuesday 31st January. Drop by at 7.30pm for information on current projects and you are very welcome to get involved. Volunteering is very rewarding and requires only a little contribution of your time. The payback is often longer and much more valuable than any RHI scheme. 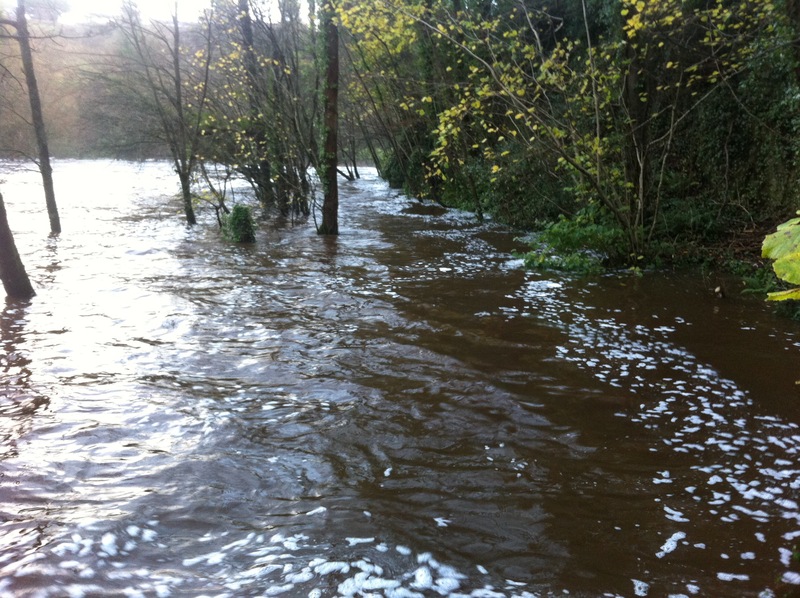 The river Blackwater provides an escape route for water along the Benburb valley as it gravitates towards lough neagh. Last night we entertained Desmond as he made his way east across from the Atlantic, and we were battered, with strong winds and rain. When it quietened down outdoors this morning and the sun came out it was time to explore the impact along Benburb Valley Park. 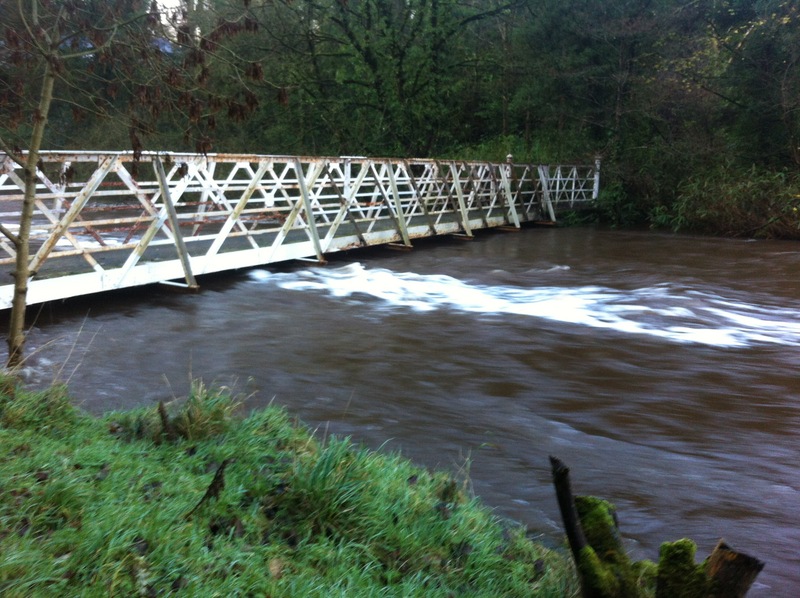 Both the white bridge and its little brother were passable, but it was clear that the water was rising still. While crossing the river I was reminded of a story a local lady told me of crossing the bridge and “it shaking”, as she made her way to the other side. I thought today I would witness the same but was disappointed as ‘dessie’ had not rained enough. The heron had already spotted me and moved swiftly to a new hiding place further upstream. I tried to follow but my route had to change as the race and river became one. This stretch in the photo above, is usually covered in fine sand providing a nice relaxing walk, even bare footed if you are game. 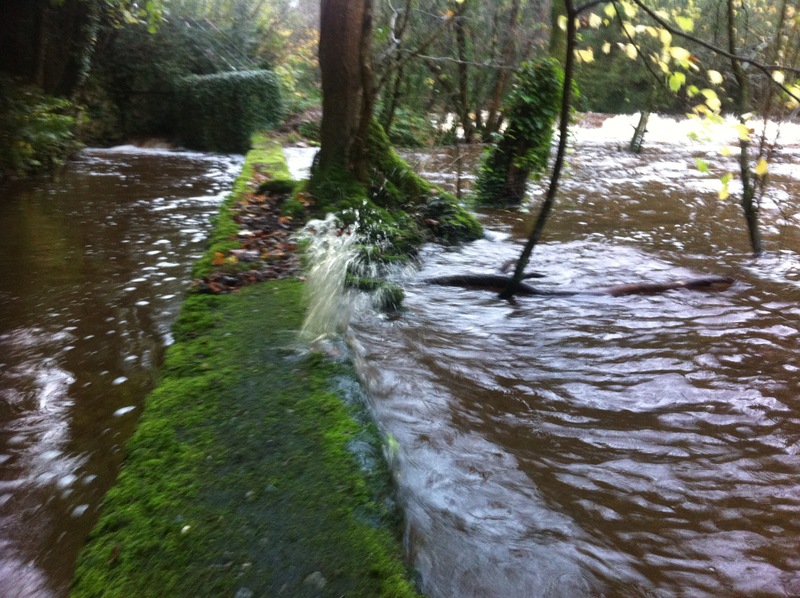 The water was easily a foot higher than the last heavy rainfall when Clodagh came to visit. Im betting the next storm will start with an ‘e’? Noise levels were up at this stage as I arrived at The falls. 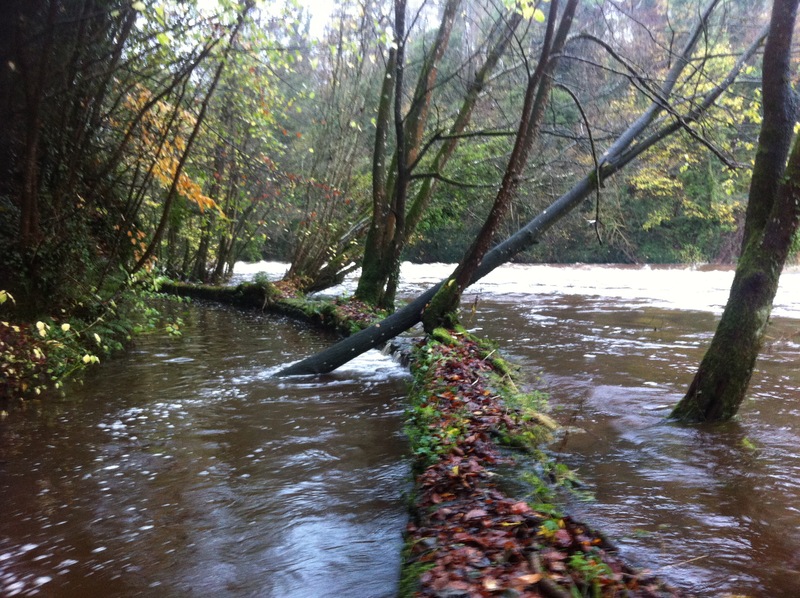 The Benburb salmon must be tough fish to navigate through this to their final resting place upstream. 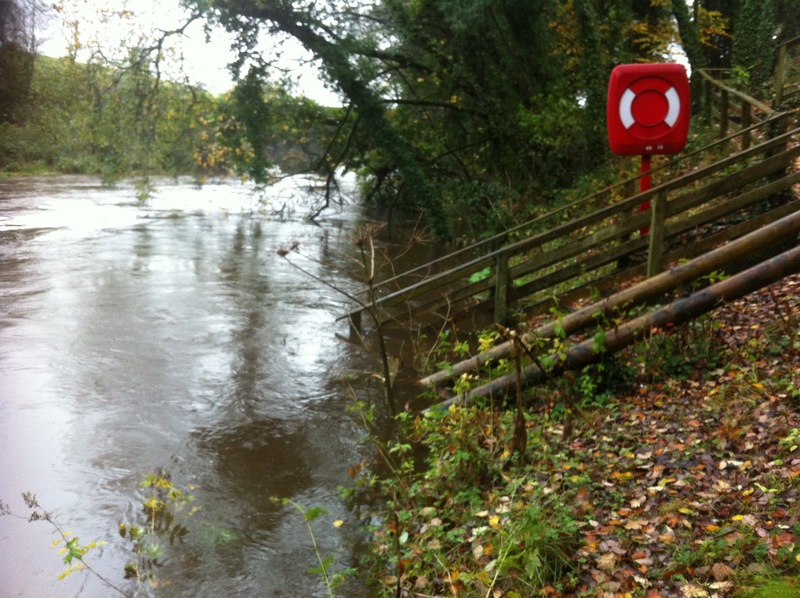 An interesting place to note the rising water levels back at the village is mc guigans well. 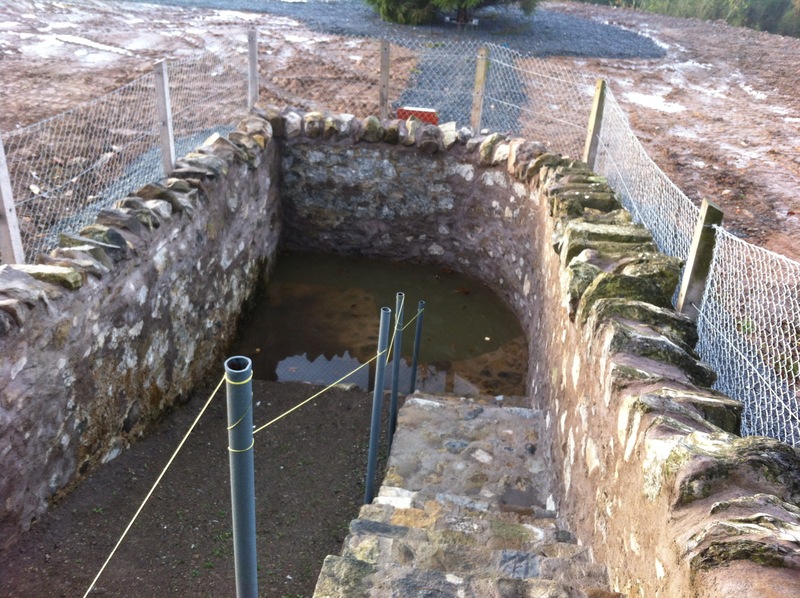 The effects of a rising water table were clear as the well was flooded today. I tried to figure out if the water in the well rises due to the falling rainfall or can it not simply get away due to the rising water table? Worthy of a discussion and pint! Judging by the colour of the water, I can see why this well was used for cooking purposes only. I couldn’t resist a walk back a couple of hours later to check the river level at the white bridge and was disappointed again. 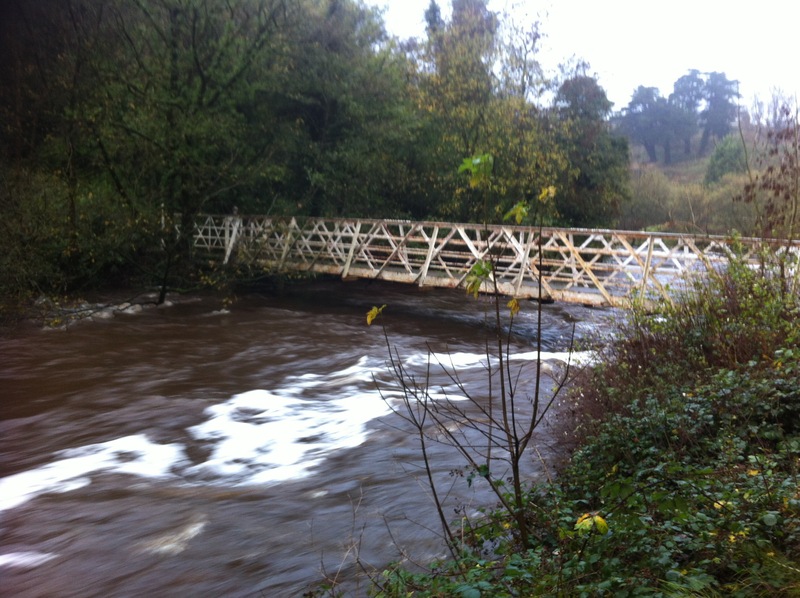 The water was up and over the bridge and I’m sure she was shaking, but I couldn’t get to it as junior was underwater! 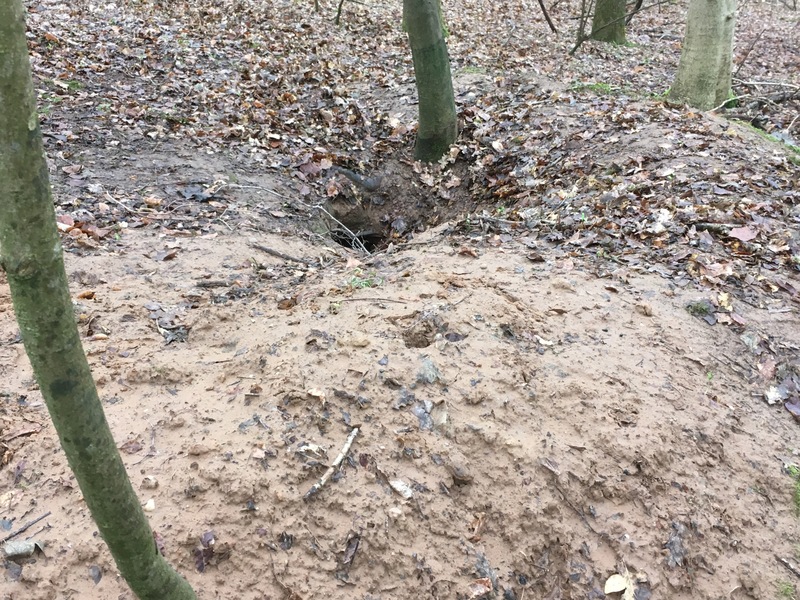 Even though the rain had long stopped there was clear evidence that there is more going on under our feet than we can imagine. Benburb & District Community Association in Benburb has received an early Christmas present after an award of £308,000 was made to help develop Benburb Playing Fields, turning it into a space which can be used by the whole community. The money has been awarded by the Space & Place programme, a £15million Big Lottery funded capital grants programme which seeks to connect more people and communities together by making use of underused or difficult space. 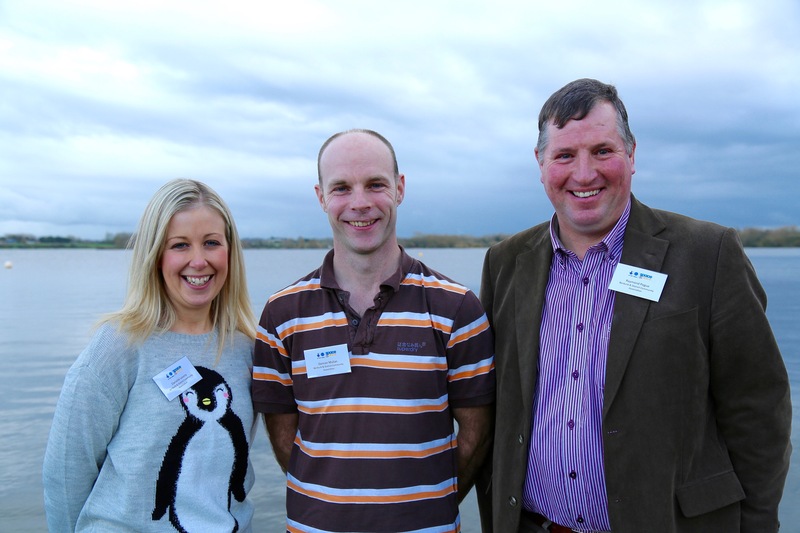 The programme is delivered by a consortium headed up by the Community Foundation for Northern Ireland. The consortium also includes Groundwork NI, the Rural Community Network, the Public Health Agency, the Northern Ireland Housing Executive and the Northern Ireland Environmental Link. 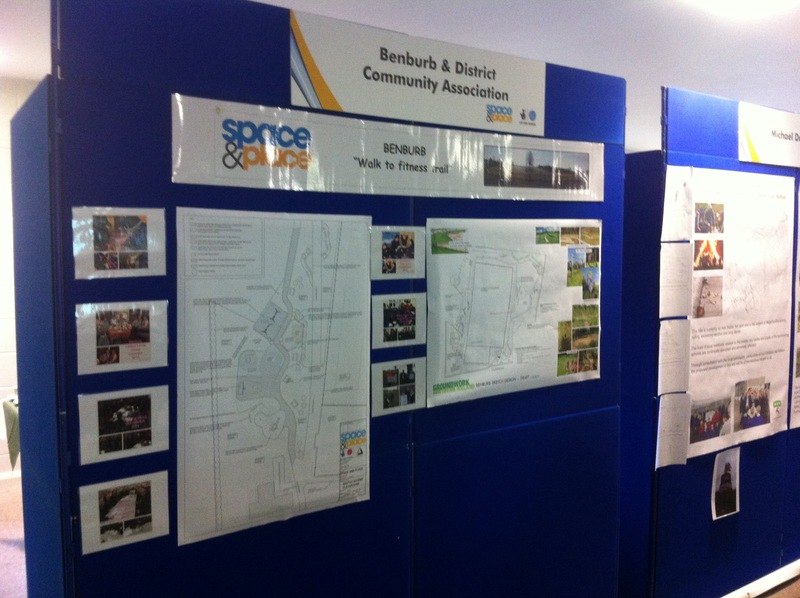 The grant means that Benburb & District Community Association (B&DCA) working in partnership with Mid Ulster District Council, will be able to develop a walking trail, fitness pods, social hubs, a Grow Wild area and fencing around an existing sports pitch. When the work is completed, the local community will be able to take part in activities aimed at improving health and wellbeing in an accessible, well-lit safe space. Speaking about the award, Damian Mullan (Chairman B&DCA) said: “This is a dream come true for local people in this area. It is the result of three years’ work and will transform the village at the weekends in particular, where families will be able to spend their leisure time close to home with neighbours and friends. “We are indebted to the many local community and voluntary sector groups in the area who contributed to the concept and design for this space. 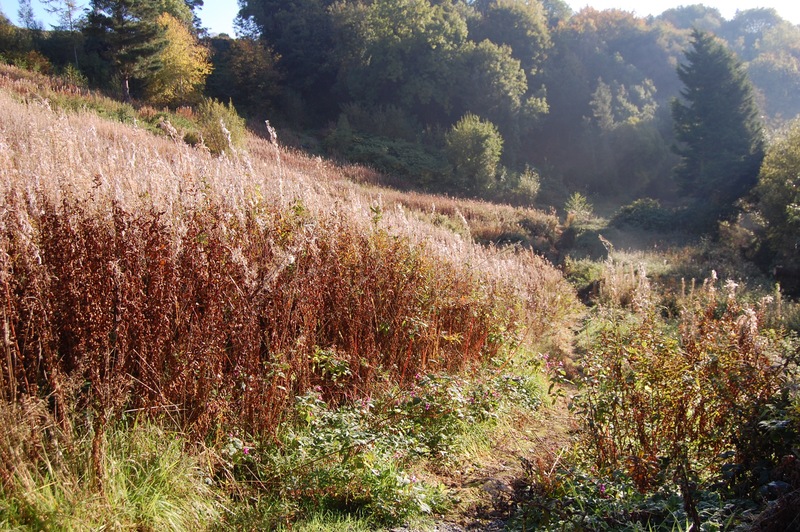 To realise this vision will bring much enjoyment to the young and elderly in particular, by providing access to quality green space,” said Damian. 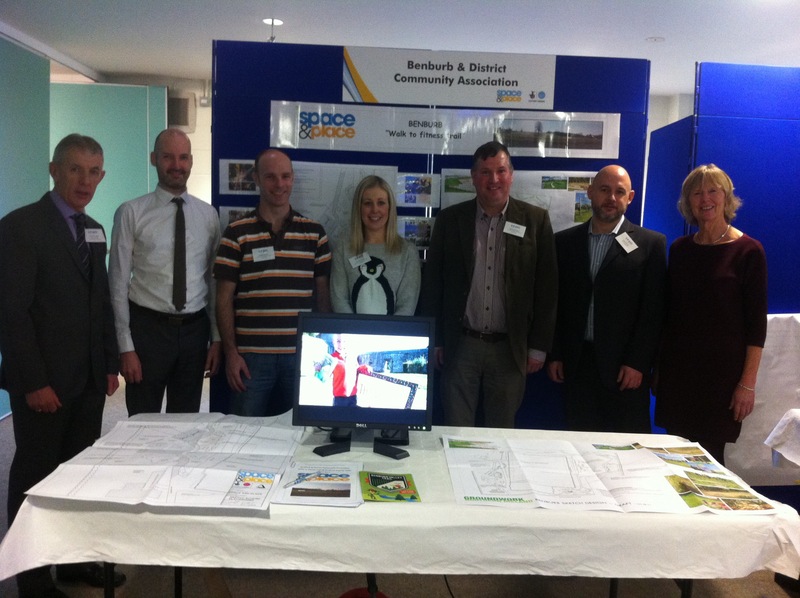 Michael Hughes Space & Place Co-Ordinator, said: “The Space & Place Consortium is delighted to be announcing another round of Space & Place grants following a highly competitive application process. “We have seen first-hand the positive impact these grants have had in communities throughout Northern Ireland following previous Space & Place awards. 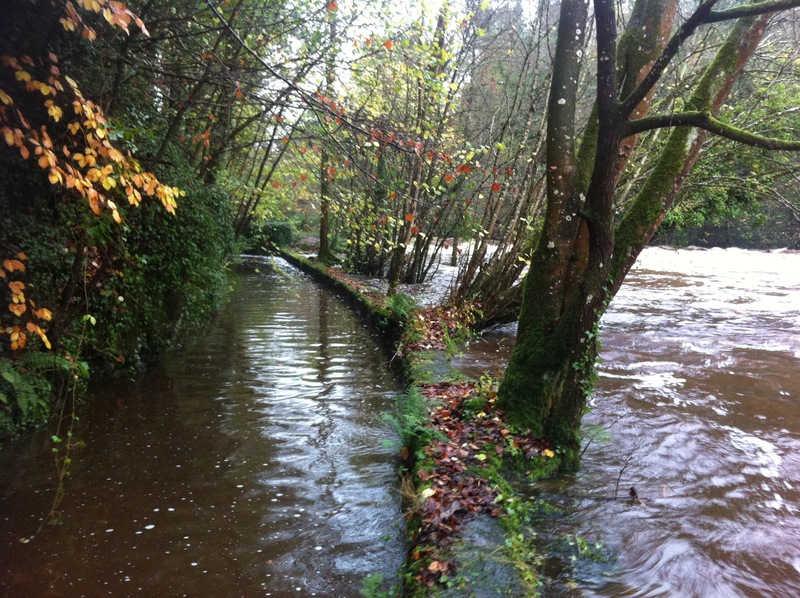 The river Blackwater normally meanders quietly through Benburb with diguised fast flowing currents hidden by the tree lined banks. The sandy beaches along its course provide playgrounds for the many children who use them as a launchpad for skimming stones. After 24 hours of rain and a wet week, it had a different look today. The beaches and many fishing perches were underwater and possibly swept away, only time will tell. 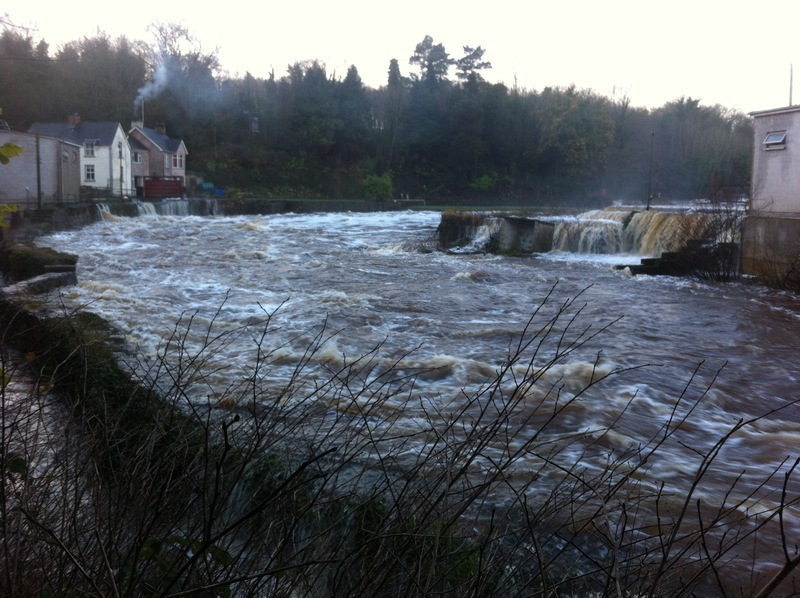 I wondered as I walked if I would see any adrenalin junkies in canoes braving the rapids. I was looking forward to watching them bunny-hop the white bridge as the head room was tight. Normally hanging right after the white bridge and ducking under the bamboo leads to a sandy walk along the river. It looked a little different today. The heron had already spotted me and took flight, so I kept going in the hope of catching him again. His surveillance techniques are impressive and he rarely lets you catch him in action, always managing to be on the opposite side of the river. I felt like a circus performer balancing on the mill race wall as the water splashed my feet while trying to keep an eye on him as he took flight. The viewpoint at the forest clearing was spectacular and stopped me in my tracks. 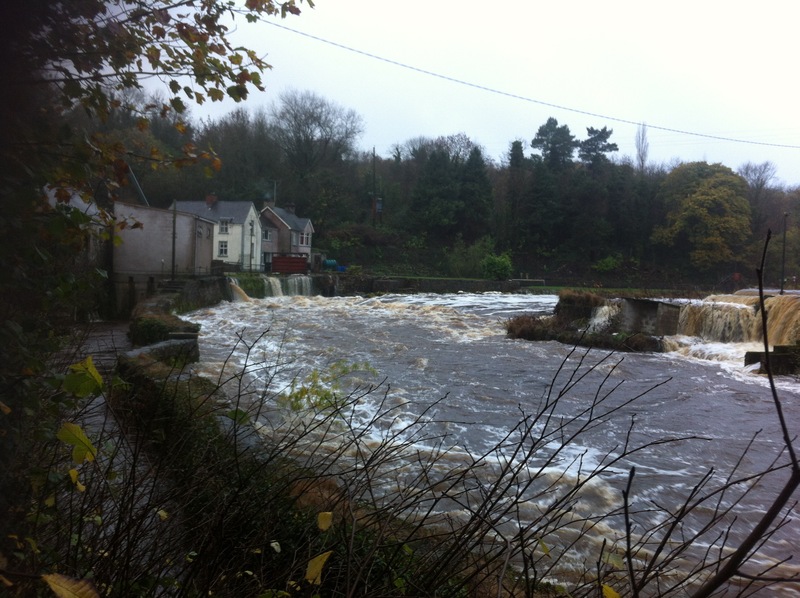 All the sluice gates and narrow waterways were bursting at their banks. I wondered if the houses perched inches above were on sandbag alert. A short track back down to maydown and I realised why the canoeist trail was quiet. 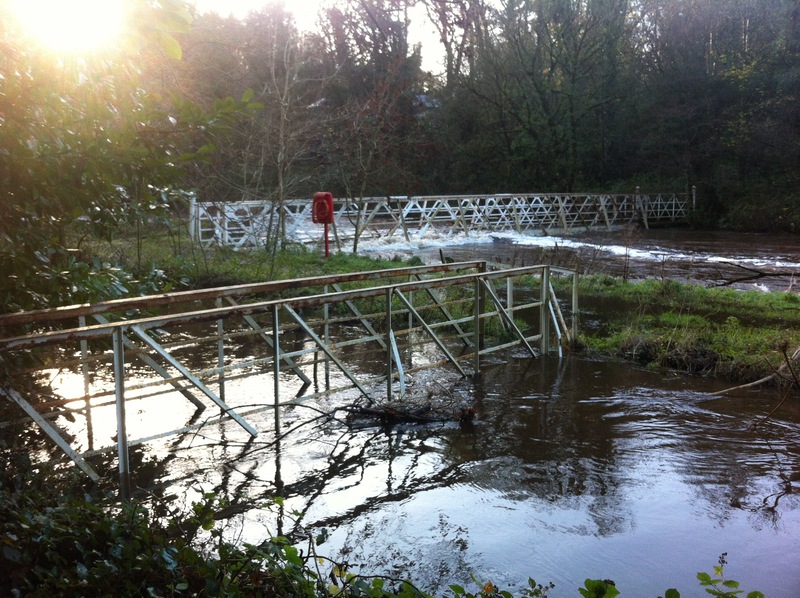 The ski run and steps were lost amongst the rising water. It did look a little easier today and I look forward to giving it a go. On reaching Maydown bridge it was time for a rest and a well deserved drink. Thanks to the toddler who left me his tommy tippee it went down a treat. We have finally launched our booklet and phone app titled “Benburb Valley Trail”. 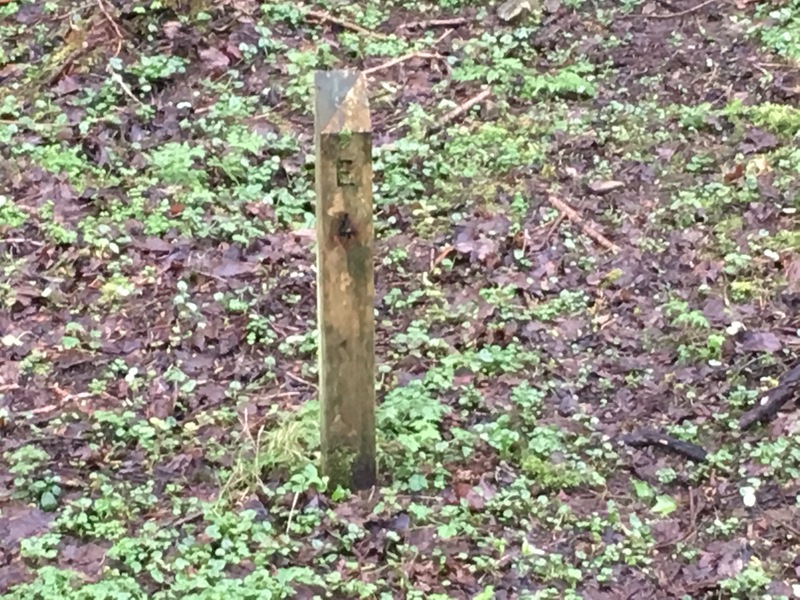 This project is designed to encourage more people to engage with the outdoors as they enjoy the sights and sounds around the Benburb valley park. The booklet and stickers will be available in Mcanallens, Benburb, the local village spar and other selected outlets. They are also available at reception in the priory. Please look out for the poster. The app is currently available from google play and the Apple Store and is free to download. Thanks to our sponsors Big Lottery and Grow Wild. Also to the support of the priory in Benburb who continue to allow local projects like this to grow. A Saturday stroll took in the sights around Benburb Valley park, during a sunny October morning. There was plenty of activity as the local rabbits hopped quickly off the trails, alerted by the crunching sounds of stones under my boots. The meadow was unusually quiet today, with little sight or sound of the pheasants who are normally feeding in amongst the long grass. They don’t normally give much warning as they take flight, often taking your breath away, as they cross your path. I was on high alert as I rounded the last bend along the meadow. 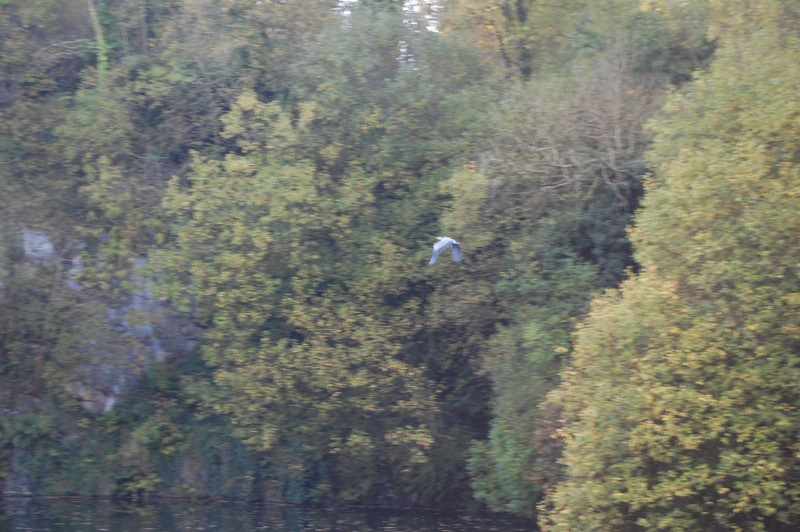 I tiptoed quietly over the white bridge and along the race to see if the herons were feeding. Having brought the D40 today I was hopeful of a good shot. They are a very alert bird with a sixth sense for visitors, often fleeing to a high perch until the coast is clear. The river was quiet though and there was little flies, so even the small birds were scarce. I stopped up at the viewing point for one last look, hoping the large male, who looks like he is the boss and number 1 “Benburb heron”, was perched on the weir or another of his usual hunting spots. The coast was clear so I moved on. As I passed the quarry I decided to pop in for a quick picture given the good weather and just as I peered into the water, he gave a screech and took off, using all his strength to rise above the limestone cliff face. I disturbed his nap but what a great sight! I was happy as I headed along, camera safely tucked away down the Eco trail to maydown bridge. 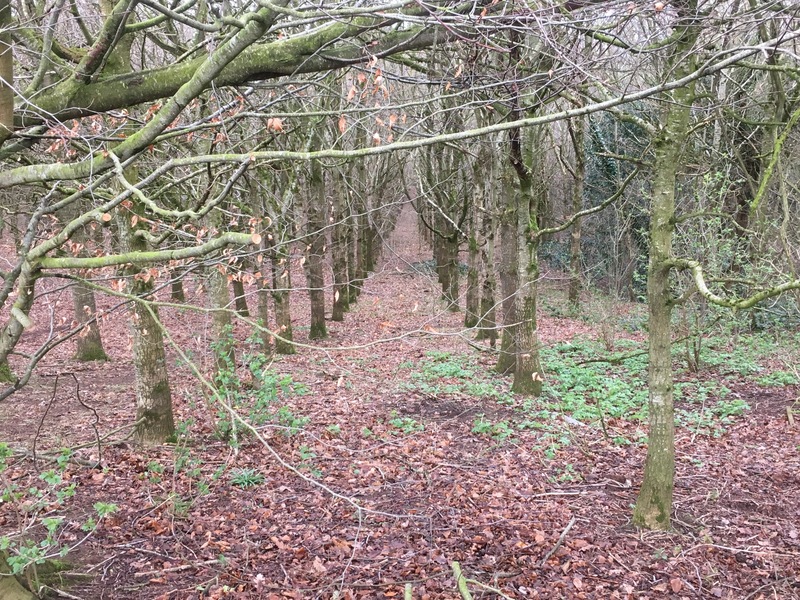 After crossing the bridge I went back through the forest under the row of beech trees, home to the many squirrels busy gathering their winter supplies. I walked up towards the graveyard, stopping to decide which story I believed about the origin of the strange stone building that is nestled in the corner. 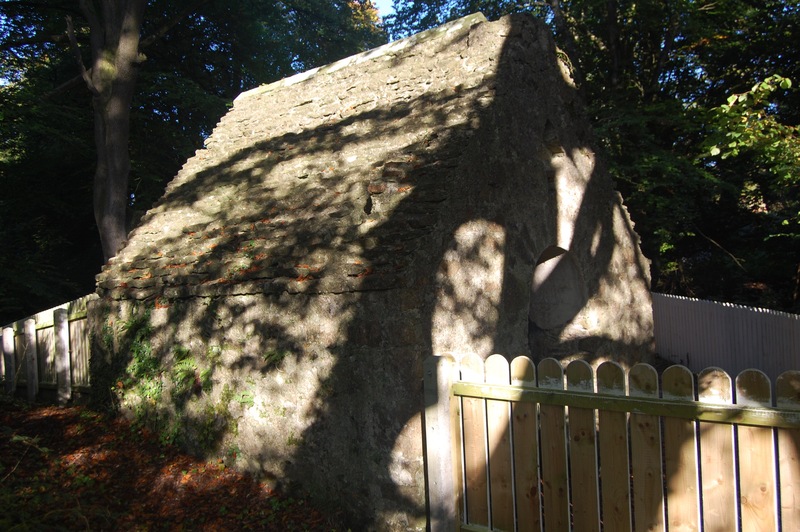 An ice house or a medieval chapel? Hopefully when the servite library project is up and running, I’ll be able to find the answer, while enjoying a nice brew.